Isis Medical is proud to be the original provider of the revolutionary Total-Lift Bed by VitalGo. The unique design allows just one caregiver to bring a patient from supine to a full standing position (and any position in between) with zero physical lifting. The Total-Lift Bed marks a new standard in patient care. It ensures the comfort and confidence of the patient while maximizing safety for patient and caregiver alike. 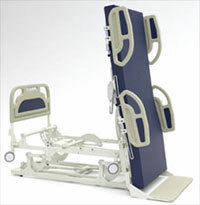 With the Total-Lift Bed, the patient can be brought safely to any position with the simple push of a button. The Foot-Lifter automatically moves in and out to adjust for the maximum comfort and safety of the patient. This allows the bed to achieve positions unlike any other bed available. The VitalGo Total-Lift Bed automatically adjusts prior to lifting the patient and will continuously adjust during the lifting process to ensure the patient’s safety. It will lower the patient gently to the floor to allow for complete ambulation with controlled weight bearing. It will also adjust to any sitting position securely while offloading the heels. The Total Lift Bed has all the latest safety features, including a Battery backup. The Total Lift Bed is FDA and CE Registered. VitalGo has adopted all FDA clinical guidance to reduce Entrapment.